Mary Hawkes explains her work helping to make genetic resources for New Zealand’s kōura (freshwater crayfish). New Zealand is a country with weird, wonderful, and unfortunately endangered native species that have spent millions of years evolving in a unique ecosystem. From the kākāpō to the tuatara, conservationists are now using genomic data to help preserve our natural heritage. The genome of an individual, the sequence of all of its DNA, is like a big, complicated book. To help understand this complicated book, geneticists use a reference genome, which is like an encyclopedia that makes reading new genomes from the same species much easier. The human encyclopedia was an expensive one – it took eleven years and three billion US dollars to assemble a draft of the human reference genome, which has since been invaluable in helping our species. Thankfully, the science of assembling and analysing genomes has had some rapid technological advances in the last decade. Now, it’s possible for us to assemble the genomes of other, less important (according to humans) species, at a fraction of the cost and time of the first human genome. We can also assemble just the biologically relevant bits of a species genome, getting the sequence of the genes that are being used and expressed, rather than sequencing the bits of DNA between genes that aren’t genes themselves. These expressed sequences make a transcriptome, and it’s like only assembling the important paragraphs of a book. Here in the Otago Department of Biochemistry, the Laboratory for Evolution and Development has been creating genetic resources to study Paranephrops zealandicus, an almost completely unstudied species of freshwater crayfish, also known as kōura or kewai. Kōura play a significant role in keeping our freshwater streams and lakes healthy, due to their ability to eat anything and everything. But until this study there has been very little research into their genetics. The genus Paranephrops is so unstudied that it’s likely that, instead of the two kōura species we recognize currently, there’s actually either one or three! So, there is a lot we don’t know about this native crayfish, and having a transcriptome and reference genome is going to be helpful for future work studying them. If a genome is a book, then assembling it is like trying to piece together an encyclopedia that’s been through a shredder. This is because we can only read a short fragment of DNA sequence at a time, like only being able to read a single word or part of a sentence. This makes assembling a genome an inhumanly complex job, which is why we’re all so thankful computers exist. They use algorithms to piece together sentences, by overlapping the fragments they have. So, if there was a fragment reading ‘a fresh’ and another reading ‘freshwater crayfish’, then the computer’s algorithm will stitch it all together into ‘a freshwater crayfish’. This process repeats itself again and again, building up longer and longer sequences until the entire genome is built. But the computer can run into problems with repetitive regions. If there’s a region of the genome reading ‘a freshwater crayfish a freshwater crayfish a freshwater crayfish’, and the fragment the computer is working with is ‘a fresh’, the computer doesn’t know whether the fragment came from the first repeat or not, or even how many repeats are there. This is why transcriptomes are useful – because they are only assembled from the sequences of genes that are being used, they avoid the repetitive sequence of DNA between genes. An assembled transcriptome then helps the computer assemble the rest of the genome around it, using the completed transcriptome as a scaffold, and makes the genome assembly much better. Now that the kōura genome and transcriptome has been made, researchers will be able to use these genetic resources to study the species. The transcriptome can be used to track the expression and location of proteins, either by helping scientists to design the tags used to track the proteins, or by being used as a reference for what the expression levels of the genes that make the proteins are normally. There are also population level studies that need a reference genome to be possible. These studies look at the differences in a local population compared to the reference genome to measure the diversity of a species, how much variation is in their gene pool. 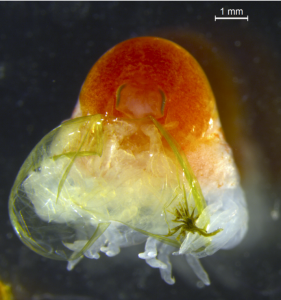 This is very relevant to kōura conservation work, because there have been indications that the species may be suffering from inbreeding, producing congenital deformities in the hatchlings that prevent them from surviving. We have found hatchlings with one head and two bodies, and conjoined twin hatchlings that emerge from the same egg! 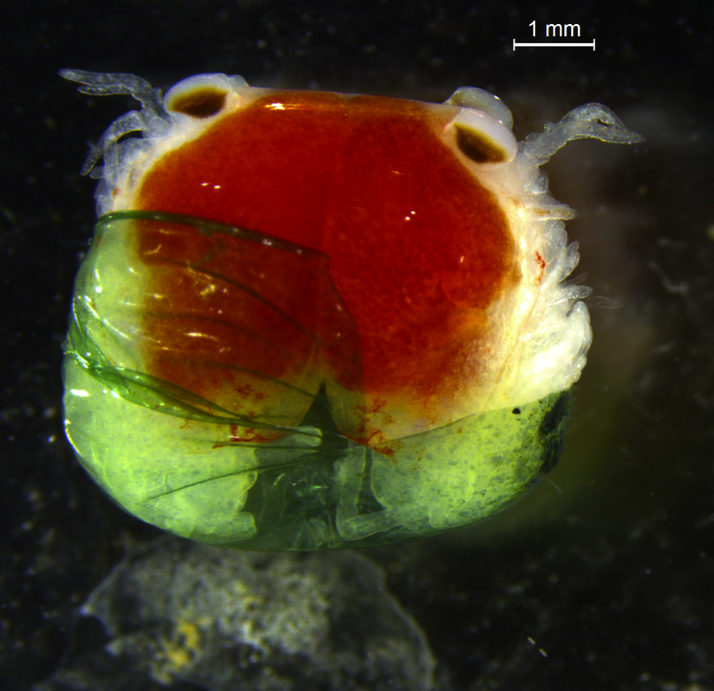 A hatchling with one head and two bodies – instead of two legs on each segment, it has four. These are signs that the kōura populations might not be healthy, but it’s going to take a population study to understand if inbreeding is the cause. Fortunately, there is also a solution, a conservation strategy called genetic rescue. Genetic rescue works by comparing kōura populations using the reference genome and transplanting very unrelated individuals from one population to another. This restores genetic diversity to the populations, and stops populations from inbreeding. 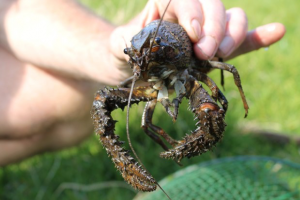 As well as its impact on conservation work, the kōura reference genome should also allow researchers to isolate how many species of freshwater crayfish New Zealand has, clearing up the taxonomic confusion that is the Paranephrops genus. In order to conserve native species, first we have to understand their current health, both in terms of population numbers and genetic diversity. The newly created kōura resources are an example of how quick and accessible genome and transcriptome assembly has become. As New Zealand strives to meet its conservation goals, genetic resources are an ever easier to make, ever more important tool in the toolkit to help, protect, and understand our natural heritage. This entry was posted in Uncategorised and tagged genetics, kōura, New Zealand native, Professor Dearden, transcriptomics by Miriam Sharpe. Bookmark the permalink.